Feature of the Foot Pad: 1.The pads featuring 3-D molded foot bed and modern ergonomics have amazing grip and foot arch support to ensure a very secure and comfortable ride. 2.The anti-slippery square dots on the pads increase the adhesion properties giving the riders better control over the board. 3.Extra large screw holes to secure the foot pads on the board easily. 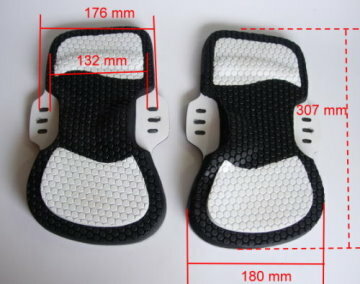 4.Regarding the specification of this foot pads, please see www.antigkiteboarding.com for reference.